Although San Sebastiano lived and died in Rome, in Sicily on January 20, the early Christian martyr is celebrated with fervor in the towns of Acireale (Catania), Tortorici (Messina), and Barcellona Pozzo di Gotto (Catania). 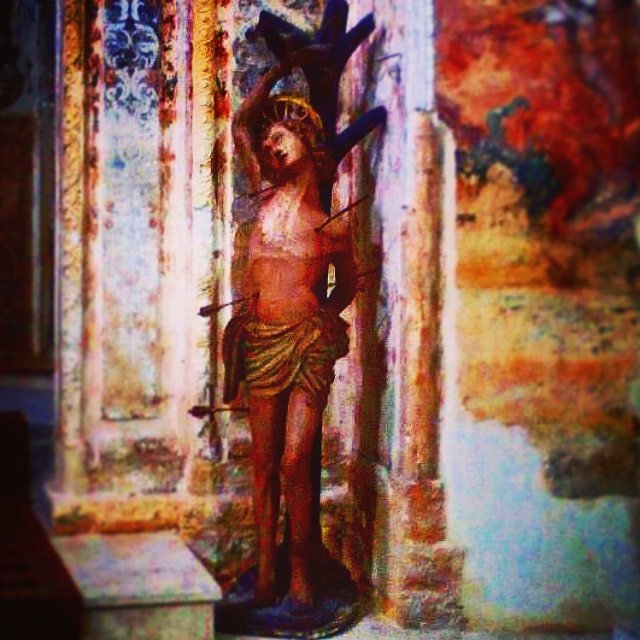 This photo of the Saint (which I’ve made to look like a painting) was taken by our Experience Sicily local guide and professional driver Sebastiano Garifo at the Cathedral in Castelvetrano. Saint Sebastian, who is the patron saint of police, soldiers, archers, and holy death, was ordered to be killed in the late 3rd century because of his devotion to Christianity. In their first attempt at executing him, as ordered by the Roman Emperor Diocletian, his fellow military serviceman used him as a target for their archery practice, which is the reason he is most often depicted tied to a tree with arrows penetrating his body. Sebastian was left to die, but was nursed back to health by a fellow Christian. Eventually, however, his survival and even stronger faith was revealed, and he was clubbed and left for dead in a Roman sewer by Diocletian’s men. Sicily’s citizens revere San Sebastiano because he is credited with eradicating a terrible plague that afflicted the island in the late 1620s. I’m reading your book, right? This story made me feel sad. What a tragic end. Yes, tragic end indeed. It is an ancient story though, of how beliefs can really drive someone’s actions, for better or worse. And that is still so true that our beliefs, however flawed, drive our actions. Something to ponder on my next walk!